carving to the Hudson’s Bay Company. I was given a pair of mitts for it, although I was hoping I’d get candy. My mother had told me that I couldn’t even do the finishing sanding on a carving because I was too young. But I have been carving ever since, and, when I’m not carving, I’m out hunting. My life hasn’t changed in all these years,” he said during an interview with Inuit Art Quarterly (IAQ) in 1998. Although he had been carving for many years, it wasn’t until the early 1990s that he made a decision to devote most of his time to making art. “I realized at the time that I needed to improve my work. I began taking even more care in my sculpting, increasing my enthusiasm for it. It was a bit like starting over again” (La Fédération Coopératives du Nouveau-Québec website http://www.artnunavik.ca, accessed 29 September 2008). 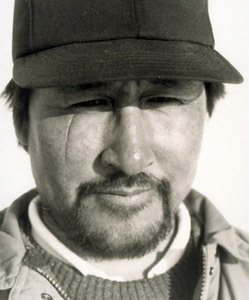 He produced a number of prints including a self portrait, while the Inukjuak print shop was in operation during the 1970s. [IAQ] 1998). He chooses to work only with hand tools since, he says, power tools make him lose touch with the stone. He begins carving by sawing off the excess stone, then chipping away at it with an axe until the shape resembles the idea he has in his mind. Towards the end, he makes the surface smooth with sandpaper and meticulously adds details. “Sometimes, when you look at a piece of stone, it already has a shape.” His sculptures consist largely of narrative scenes. Jobie Ohaituk is one of the better known carvers in Nunavik. His work has been purchased by the Canadian Guild of Crafts in Montreal, the Canadian Museum of Civilization, and the University of Lethbridge Art Gallery. In 2001, Bombardier presented one of his carvings entitled “Father and Son Fishing” to U.S. President George W. Bush.